Having lived in China for nearly four years now, I have witnessed as well as experienced the lifestyle changes for individuals in the emerging middle class. Chinese people are not only relocating to the larger cities but also moving from traditional residences where shared spaces are the norm, into high residential buildings and “communities” metro stops wide. As people move up economically and concrete walls begin to indicate this, there manifests an increasingly impersonal and distant sense of community. From international student dorms and a higher-end Shanghai “community” to an older development in Beijing’s historical quarter, each chapter of my China life has offered a different type of lifestyle. As many American college grads know, dorms present a bubble of fun – equal part excitement and drama. The international student dorms at Fudan University and Nanjing Normal University were very much the same. The school segregated international students and local Chinese students, creating a bubble of English, Russian, Italian speaking cliques. Hyper camaraderie is built by living, schooling, eating in the same pattern and same spaces. At any given hour, you’re able to solicit the attention of a peer to do something (e.g. going for a road beer at midnight, gossiping about friends until dawn). Then afterwards, when you enter “real” life, you realize that the 9-5 job changes those conventions. During my event planning days in Shanghai, I lived Downtown in an upscale 30-story building where I rarely met my neighbors. During my two years of living there, I may have seen the two households that share the same floor as me three times at most. When you see them, you may exchange a smile, but there’s no “How’s it going” like they mean it. To enter, you step through a gate, pass the security guards, key in the password, walk through the first door, walk through the second door… unlock unlock, lock lock. Since my move to Beijing in 2011, I made an effort to live in a different environment amidst the few hutongs and siheyuans that remain. In a short amount of time, I befriended my neighbors. I’ve been able to borrow tools, fix broken bulbs in the late night, and solicit warm conversations when needed. When I walk outside wearing too little, my neighborhood grandmother isn’t shy to tell me that I’ll regret it when I’m old. The middle-aged uncle who seems to always be smoking a cigarette at 9pm in the shared courtyard space tells me daily that I’d better lock up my bike. This close-knit community radiates humanity, a quality sometimes arduous to find in developed countries. As high rise “communities” hinder human connection, we see a different type of community beginning to evolve. Whether social networking sites or their mobile counterparts, there is something dear the Internet can bring. Inspired by my day-to-day, I’ve thunk up Herb & Lace. I hope to unite women dispersed around the world in both on-line and off-line capacities. Herb & Lace’s aim is not limited to documenting familiar feats, but rather exploring and challenging our current lifestyles and sharing them. Through testing unknown recipes, planning spontaneous day trips, celebrating new creativity, and then imparting these experiences with readers and new friends through good content, we aim to bring people together personally. Welcome to Herb & Lace. Today’s the first day of our journey and already we have fourteen unique voices contributing from a dozen cities worldwide. Let us know what you think. This entry was posted in Beijing, Thrive and tagged natasia, thrive. We did the same thing for the same reason, Natasia. When we lived in Beijing, we stayed in the hutongs, and met the most amazing people. We had dinners with our neighbors nightly and it improved our Chinese vastly. Since moving to the Bay Area, I’ve noticed far fewer people engaging in the same sort of neighborly community. Even though I’m a pretty outgoing person, it’s hard to strike up a conversation with neighbors who run as quickly from door to car and car to door as humanly possible. Slowly we’re getting to know our neighbors here, and in the same way, I’m looking forward to getting to know more about the lives of these different women! You and Walker used to rave about your Beijing life, but back then, I didn’t really have the experience to know why. Having lived in Beijing nearly a year now, I totally am proud to be in Beijing (except for the pollution). There are Shanghairen and there are Beijingren. ;) Where did you guys live while in Beijing? I know you used to spruce up homes. That’s a hobby of mine too that I want to start exploring more, how did you find contractors? properties? Beijing rocks and so does that picture. 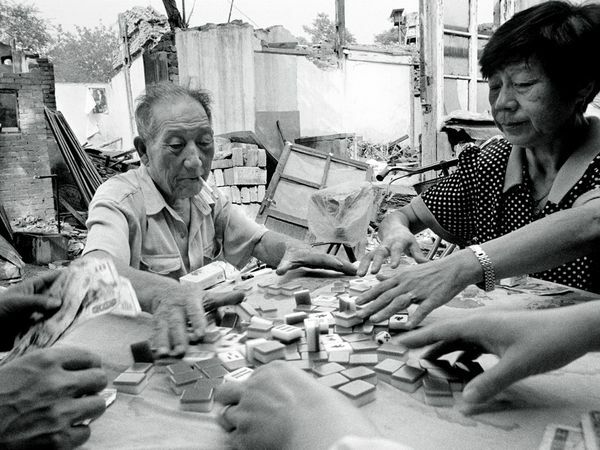 I love how the details/experession on the man’s face (and mahjong) contrasts against the destruction and bricks behind him. It’s like he owns his world and doesn’t let it own him, no matter how brutal it gets. There’s a massive contractor market on like north 4th ring, where you can make site plans on AutoCAD and get a number of competitive bids from different outfits with competing store-fronts. But I forget where exactly — Kate might know. We almost got arrested there too, but that’s another story.